In order to provide good quality images, the file size is a bit large. Thank you for being patient as it downloads. These documents were designed to serve as a student portfolio. I have found that parents do not always understand the WHY behind an activity, this portfolio is intended to provide both students and parents with a little bit of more information on the Elements & Principles of Art. 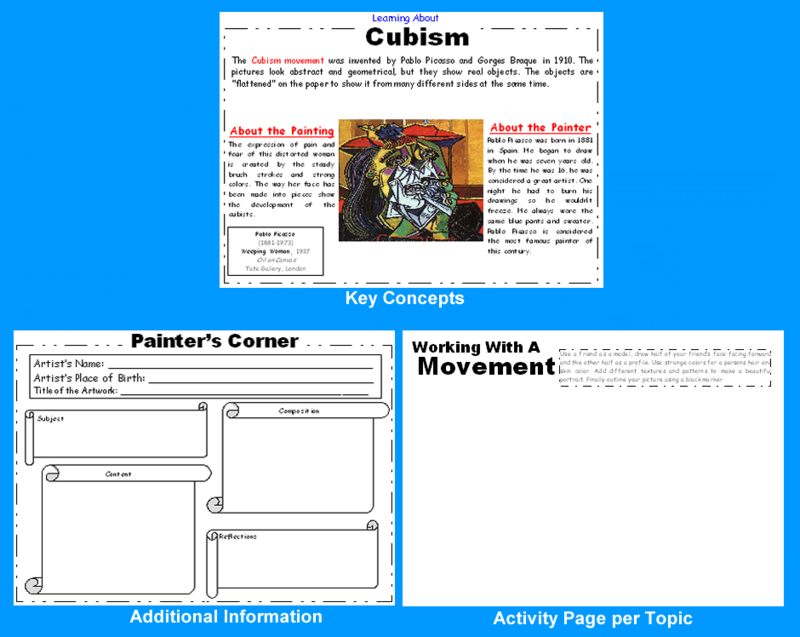 The Analyzing Worksheets help students focus on the purpose of their artwork and become more reflective about their thinking processes and their decisions. These documents were designed to introduce students to the world of art history. In 1st Grade, Art Styles are paired up with a representative piece of artwork to help students begin to examine what they see on the canvas. Information about the painter and the artwork are provided in brief. A graphic organizer aids students in learning to read the ID cards on artwork. In 2nd to 6th Grade, Art Movements are paired up with a representative piece of artwork. Information about the movement, the painter and the artwork are provided in brief easy-to-read paragraphs. A graphic organizer aids students in learning to read the ID cards on artwork. 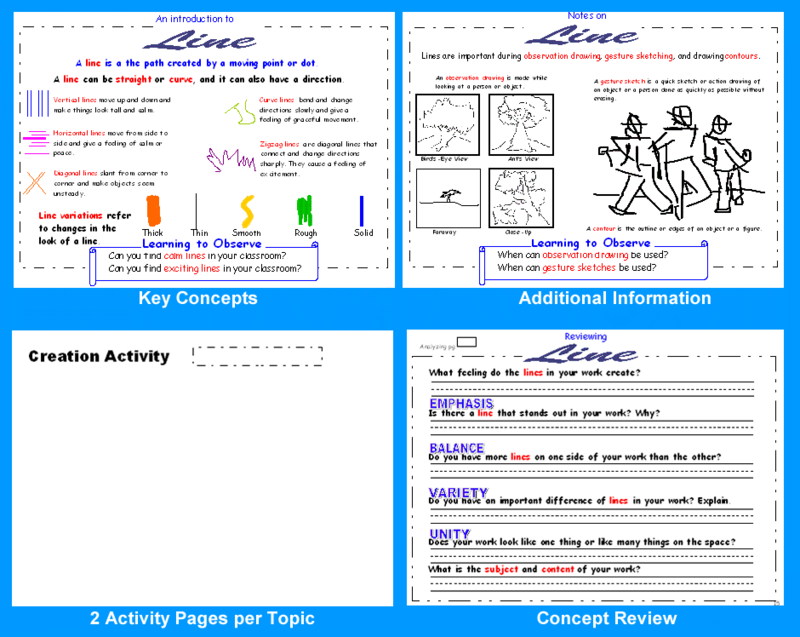 The Working with a Style activities provide lesson ideas for students to try to replicate the major components and characteristics of each style to better reinforce the learning. In Learning About an Artist & Thinking Like an Artist, students have the opportunity to reflect about the deeper meaning in the works of art and create personal connections. Each of the writing assignments was designed to have a different purpose. Such as, narrate, inform, imagine, persuade, describe, investigate, create and classify. This provides students with a rare opportunity to respond in writing to the feelings and ideas that the artwork evokes for them. 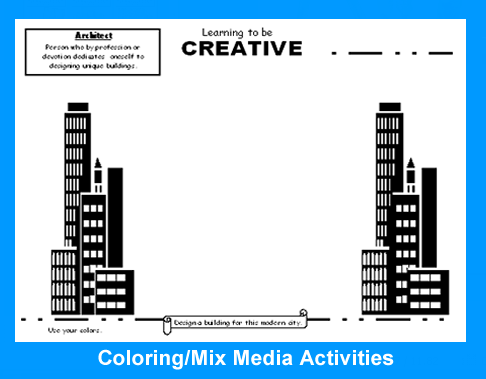 In the Learning to be Creative section students are presented with a real-world profession, they should use the starter idea to design an inovative soulution by using thier color or mixed media.